Massenet seems to have been a composer who was inspired by the voice, particularly the female voice. 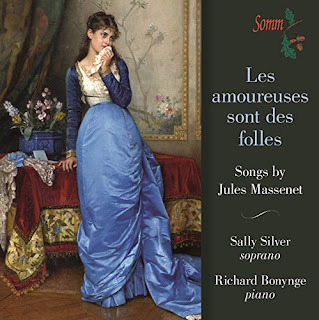 On this disc from Somm Recordings, soprano Sally Silver is accompanied by Richard Bonynge on piano in a selection of Massenet's songs with a sprinkling of duets. Sally Silver is joined by mezzo-soprano Christine Tocci, tenor Nico Darmanin and cellist Gabriella Swallow. The songs inhabit a world somewhere between the salon and the opera. Many are lyrically melodic and would sit well in a salon but Massenet usually has a slightly more sophisticated element than you would suspect. Perhaps because he wrote so much, and because his style dated badly in the years after his death, it has proved easy to dismiss his music. Few of his operas are well known, apart from a handful, and his songs even less so. The music is never less than charming and so can be fatally easy to underrate. Many of the songs are reminiscent of early Faure in their fluency and melodic style and all are highy sympathetic to the poetry they set. Sally Silver sings with fragile charm, creating a salon-like intimacy and ensuring the sense of the poetry comes over well. Occasionally the songs verge into something larger scale and more complex. Sainte Therese prie is one such, whilst the duet Horace et Lydie (sung with Nico Darmanin) is less obviously lyric and moves towards a dramatic duet. Darmanin gets to show off in O ruisseau where Silver and Tocci form the chorus, whilst Le temps de l'amour is a duet for Tocci and Darmanin. Some songs feature the cello of Gabriella Swallow and in a work like On dit, with the lovely intertwining of cello and soprano, we are a long way from the salon. Though the CD booklet includes full texts and an article about Massenet and the songs, no list of dates is given so it is tricky assigning songs to different periods of Massenet's life which makes it frustrating trying to get an overview of how his songs fit into his output. Francis Poulenc noted the influence of Massenet on early Debussy and it helps to bear this in mind when listening to the music. The songs still aim to please a little too much, but dig below the surface and you will find beauty and subtlety, though this is a recital to dip into rather than consuming it at one sitting..
Jules Massenet (1842-1912) - Tout passe! Jules Massenet (1842-1912) - On dit!